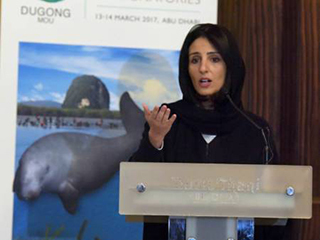 The Dugong and Seagrass Research Toolkit is a collaboration between EAD, TOTAL, Total Abu Al Bukhoosh, CMS Dugong MOU Secretariat, and the GEF-5 Dugong and Seagrass Conservation Project. The content of the Toolkit has been developed by a team of technical advisors from the CMS Dugong MOU’s Dugong Technical Group who are experts in dugongs, seagrasses, coastal communities and the marine environment and is designed for use by marine natural resource managers (government and non-government), researchers and decision-makers in Dugong Range States. It represents a significant contribution to the techniques and tools available for dugong and seagrass conservation research globally. The Toolkit will be a living resource and has the potential to make a significant contribution to dugong and seagrass conservation across the dugongs’ range. For any questions please contact the Dugong MOU Secretariat at cmsoffice.ae@cms.int.